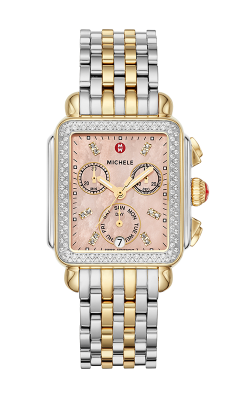 MICHELE watches are elegant while also offering tailor-made styles that can compliment any woman. If a woman desires a watch that communicates her passion for life, then a MICHELE watch will be an excellent fit for her. From elegant gold bands to mother of pearl dials MICHELE watches can provide the style that will work with any number of outfits. MICHELE watches display the iconic red crown that is synonymous with the brand and its custom features. A luxurious watch for a woman needs to be both bold and feminine, and these watches manage to balance these two qualities perfectly. There are many MICHELE watch lines for the discerning woman to choose from. The signature line is the Deco line, which highlights the design patterns that these watches are known for. The Deco line for anyone looking to make a bold statement with their watch. The Sydney line highlights femininity while remaining luxurious. 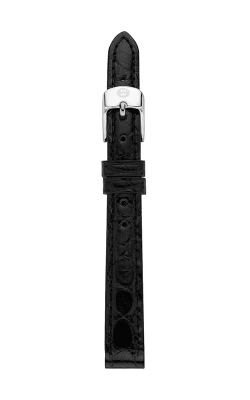 The bands are thin and interchangeable, meaning that changing the strap of a single watch allows the wearer to match her timepiece to any outfit. The Serin line features designs that are classic and will remain popular well into the feature. As times change designs may change, but classics such as the Serin line have withstood the test of time and will continue to do so. The Urban line harkens back to a more elegant time. The tonneau-shaped case with a pulsating guilloche pattern create a retro look that works with a countless number of modern outfits. The Deco Sport line merges the elegance of the Deco line with a functional sport watch. The curved silicon strap allows the wearer to comfortably engage in an active lifestyle without sacrificing the luxury of a designer watch. The Hybrid Smartwatch line seamlessly blends elegance with a watch that contains the technological features necessary for a busy life. Why Shop for MICHELE Watches at Kevin’s Fine Jewelry? At Kevin's Fine Jewelry we offer an luxurious environment to comfortably shop for the perfect watch. As a family owned business since 1981 we treat the customers like members of our own family and ensure that every question is answered in order to ensure that the customer is able to find their perfect watch. We are located in Totowa, New Jersey within convenient distance of surrounding townships such as Montclair, Fairfield, and Montville. Anyone discerning enough to be in the market for a luxury watch will appreciate the professionalism of the staff at Kevin's Fine Jewelry, come in today and pick out your perfect piece of jewelry!